Parker A-LOK Twin Ferrule Compression Fittings are designed as leak-free connections for process, power and instrumentation applications. Parker Vacuseal Ultra High Purity Fittings Parker UHP fittings are designed as leak-free components for critical applications where ultra-high pure conditions are required. 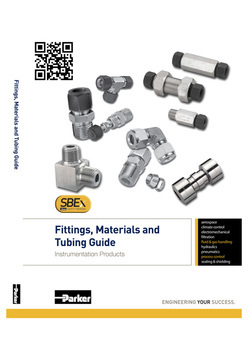 Parker NPT Instrument Pipe Fittings 3K-6K are precision machined from forgings and bar stock for connections between pipe sizes and tube sizes applications. Parker High Pressure 10K Pipe Fittings (NPT) are precision machined from bar stock. They are designed to be used for connections between pipe sizes and tube sizes. Parker NPT to BSP ISO Pipe Conversion Fittings are precision machined from forgings and bar stock. To convert from NPT to BSP & BSPP threads. Parker Phastite is a breakthrough in tube connection systems; its single assembly process achieving a tube connector that can be used in applications up to 20,000 psi/1380 bar.